What a weekend–I've got big news to share! On Friday night, I skipped out of the office and toward the beach to meet John at Masala for all the curries we could dream of. He brought a few fall beers from Sierra Nevada and we curled up in our favorite cozy corner of the restaurant for an early dinner. After our feast, we headed home and kicked back with a Errol Morris documentary, Tabloid. We headed to bed early, knowing that Saturday would be a big day! We were up and out of bed long before our neighborhood woke up, and decided to wait out the opening of one of our favorite little breakfast spots with laundry, email and a bit of housekeeping. After empanadas and oversized mugs of coffee and tea, we headed home to get serious with our to do lists. John tackled scales, arpeggios and etudes while I cracked the books. We kept an eye on the clock though, because we had a date neither of us wanted to miss–an appointment at Berkeley's The Wedding Party to see a dress I've been absolutely crazy about! I can't say enough good things about the experience working with Clara and Jennifer; they let me pull a whole pile of dresses, posed me for pictures and encouraged John to speak up about what he liked. No one teased me about saving the dream dress for last, and in the end, it didn't disappoint. To celebrate, we popped across the street to Cask's new location for a bottle of sherry and I called my mom to tell her the news as we drove across the Bay Bridge. There was no time for dwadling at home, though; I'd scored an orchestra seat to the opening night of Susannah, and I dragged John to grab a standing room spot. Luckily our swanky ensembles (and no doubt the glow of finding the dress) caught the attention of the staff, and they offered us up to Grand Tier seats in the third row! We dashed upstairs just in time for the curtain and watched Carlisle Floyd's incredible opera unfold. A bit exhausted from the emotional upheavals of the day (we also discovered a monstrosity is being installed in our ideal ceremony location, sending us back to the drawing board), we headed home for a late night snack and an episode or two of Frasier before bed. We were up early again on Sunday, and decided to whip up a magnificent breakfast of avocado toast with poached eggs, roasted potatoes with garlic and chives and plenty of caffeine. After straightening up the house, we both got into our weekend routines–reading, note-taking and highlighting for me, practice, practice and more practice for John. We both got outside for a little exercise, and while John grabbed a beer with our friend and neighbor, I dashed out to the library where more books awaited me! I also got a chance to catch up with my oldest friend and organize myself for the week ahead. Over a simple spaghetti supper, John and I enjoyed an episode of Frasier and the promise of a quiet evening with our latest reads. Tell me, what were you up to this weekend? Did you do a little fall shopping, make a plan to visit your alma mater or take up a new project, perhaps? I want to hear all about it! 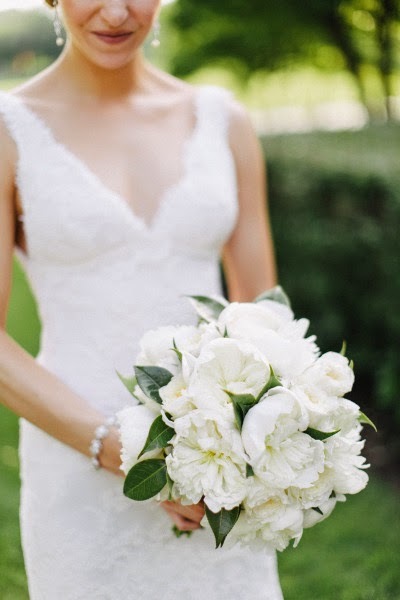 Image by Jenelle Kappe Photography, white peony bouquet by Asrai Garden. We were BUSY at work this weekend, but I made lots of money, yay! This just sounds like a wonderful weekend. So happy you found the dress, and I love that your man got to join in the fun. I've been cracking down on my needlepoint, so I haven't been doing much else! But I am looking forward to experiencing all kinds of seasonal activities starting in October and planning an extra special celebration for my guy within the coming weeks. Sounds like a fabulous weekend! That dress experience sounds like heaven! Mac and I went out for dinner on the water Friday night, a hike Saturday afternoon, beer tasting that evening then found a great new bistro in wine country that had weekend happy hour, Tuscan lighting, and a Django Reinhardtstyle trio playing. I was in love!